The Empress card — this version from the beautiful Wild Green Chagallian Tarot — is associated with beauty, creativity and love. She represents the aspects of ourselves that evoke the principles of feminine strength and power. As the counterpart to the Emperor card, this archetype is all about the yin or feminine aspects of parental authority and protection, regardless of gender. Where the Emperor focuses on wisdom, stability and responsibility, the Empress relates more to nurturing, comfort, support and emotional security. It is the “Earth Mother” archetype personified. This card represents fertility and abundance. Surrounding yourself with all things living and growing. 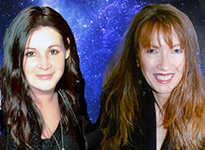 Being in touch with the earth and your sexuality, as well as your ability to create and foster life. 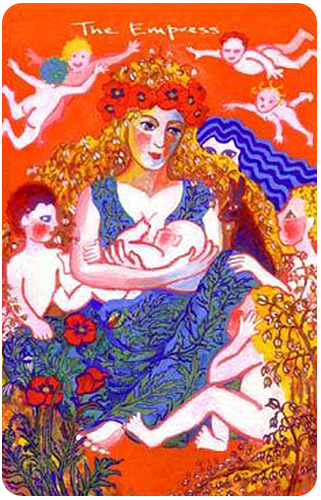 The Empress is a mother, as depicted in this card. But that doesn’t always translate literally. It can refer to mothering impulses, such as tending to the needs of others. She’s surrounded by flowers and herbs in this card, and if you look closely you can see that even her headdress and gown are “alive” with plant-life and forest greenery. This is the essence of the Empress card. You do want to make sure you’re not neglecting your own needs while you’re busy taking care of others. You want to tend to your own gardens and nourish your own soul. But as you can see in the imagery in this card, what you give out will come back to you in ways that reverberate endlessly. Today you could be seeing the world in a whole new light. Look around you and see what inspires you. You may find yourself day-dreaming, reminiscing about the past, revisiting childhood memories, or letting your mind wander beyond the tedium of your daily routine. The Muse card is unique to this deck. 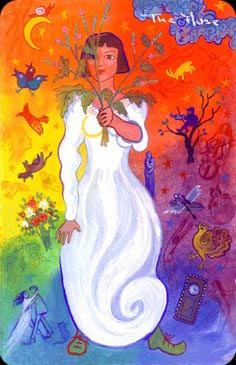 It was created as an extra card in the Wild Green Chagallian Tarot series, inspired by the artist Marc Chagall’s own muse, his first wife, Bella. Here we see her as a fresh young bride in a long white dress, a sprig of wild foliage in her hand. All around her — and against a rainbow backdrop — are tiny images: are they born of her imagination, dreams for her life ahead, or are they happy memories? Whatever they are, they’re sources of inspiration that are ripe for the picking. Think about your own “Muse.” What is it that inspires you that you may have pushed aside in favor of mundane responsibilities? Or consider the qualities that you posses that can act as an inspiration for others.